Special guest room "Futarishizuka"Many celebrities used to stay in this room. Jinpyokaku Honten is located at Kanbayashi-onsen in Nagano Prefecture. Kanbayashi-onsen springs from world-famous “Jigokudani”, where monkeys take an open-air bath. Jinpyokaku Honten that is rich in onsen was established in 1901. It is a historic ryokan, where Japanese famous writers such as Soseki Natsume, Yasunari Kawabata, and Akiko Yosano stayed for writing. Hirofumi Ito, a politician of the Meiji period, who was pictured on the 1,000-yen bill until 1984 and the imperial family also stayed there. 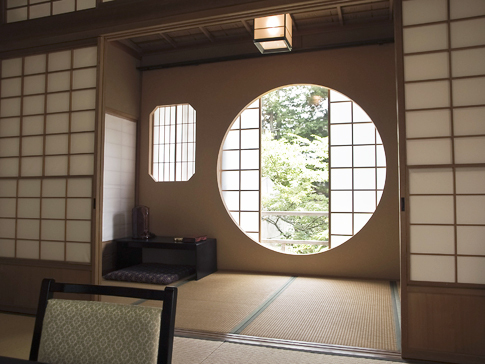 The rooms of Jinpyokaku are in Japanese style, and you can make a choice from two room types. One is in the main building and the other is in the detached building. 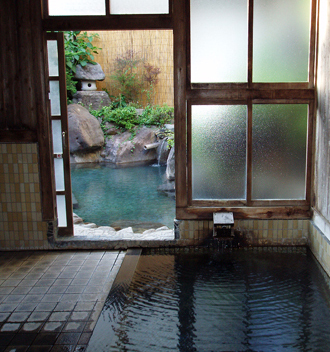 As Jinpyokaku is located in a quiet onsen resort, you feel very relaxed. It has an indoor bath for men and for women, and a Japanese garden-like open-air bath where men and women bathe together. It also has an oke bathtub that is unique to Japan. As both baths possess a system called “kakenagashi” (the system supplying unchlorinated natural hot water), the hot water doesn’t irritate the skin. You can heartily enjoy Japanese onsen supervised by a yumori (onsen keeper) who is well acquainted with and attached to onsen. The landlady entertains you for Japanese cuisine. 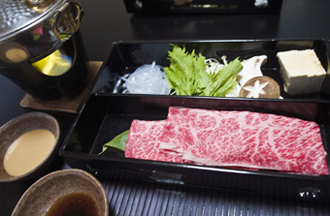 You can enjoy the main dish “shabu-shabu” with Shinsyu beef. It is exciting to see the colorful dishes such as fried freshwater fish and salad served one after another. You can enjoy staying at a Japanese ryokan Jinpyokaku with atmosphere and feel relaxed. Recently Jinpyokaku has been popular among the tourists from Australia and some other countries. 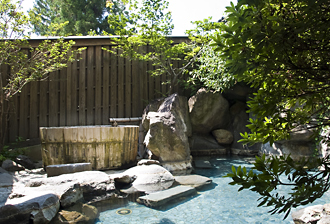 There is an open-air bath where men and women bathe together. As the open-air bath provides sufficient space for men and women individually,you feel comfortable and relaxed there.An oke bathtub is provided for both men and women. Main dish called "shabu-shabu" with Shinsyu beef Shinsyu beef is prime meat and it is tender and juicy. Including:Dinner and Breakfast, Service charges & Tax. Copyright © Nippon Onsen Research Institute Co., Ltd. Tokyo Japan.